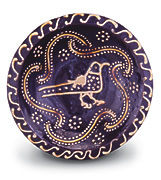 For centuries, potters all across the world have used liquid slip to decorate their wares. Though it is a simple medium - clay mixed with water - slip can be used to create dramatic and diverse visual effects. It can be dripped, trailed, inlaid, marbled, scraped and combed. Potters have used it to create images of arresting immediacy and also to fashion complex abstract patterns. This exhibition demonstrates the appeal of slip-decorated pots from many nations, including China, Korea, Germany and Italy. Special emphasis is placed on British and American ceramics from the 17th century to the present. 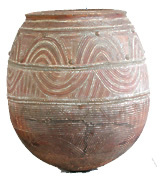 The organization of the show compares pots made using similar techniques at different times and in different places, demonstrating that this immediate means of decoration is also a nearly universal artistic language. The exhibition is organized by the Milwaukee Art Museum and curated by Glenn Adamson, curator of the Chipstone Foundation and MAM adjunct curator. Midlands, England, Dish with trailed slip decoration, ca. 1720-40. Earthenware. Lent by the Chipstone Foundation. 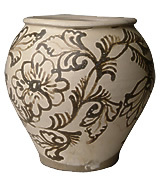 Cizhou Ware, China, Small jar with trailed decoration, 13th century. Lent by Zetterquist Gallery.